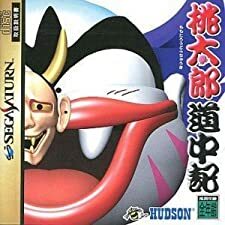 Momotarou Douchuuki (Satakore) (桃太郎道中記　（サタコレ）) is a Board game, developed by Hudson Soft Co., Ltd. / SIMS Co., Ltd. and published by Hudson Soft Co., Ltd., which was released in Japan in 1998 for the Sega Saturn. Hudson Soft Co., Ltd. / SIMS Co., Ltd.
SEGA SATURN " Momotarou Douchuuki " Japan Import SS Complete Very RARE! SEGA Saturn Spiel - Momotarou Douchuuki JAP CD mit Anl. SEGA Saturn Spiel - Momotarou Douchuuki JAPAN CD mit Anl.